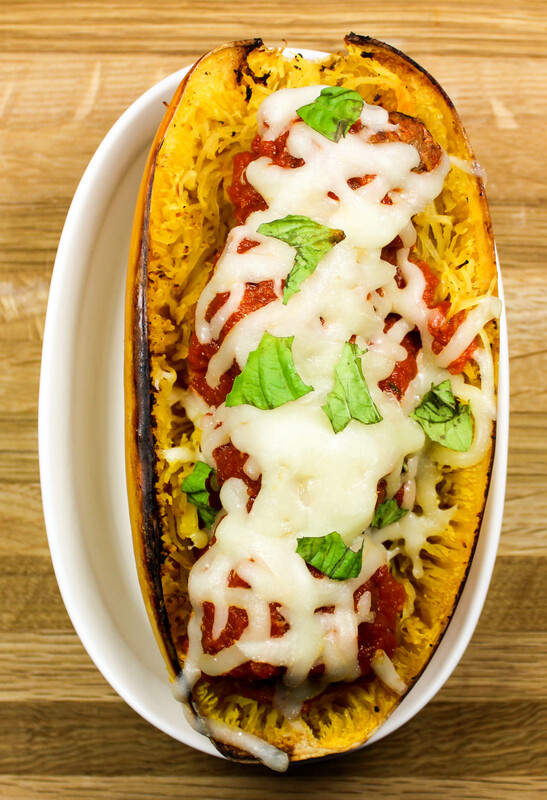 Meatball Stuffed Spaghetti Squash is spaghetti and meatballs without the guilt. Comfort food lightened up! 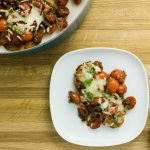 Weight Watchers friendly recipe-6 SmartPoints! What if I told you that you could have spaghetti and meatballs for dinner for less than 15 grams of fat and left satisfied and full? You would laugh at me right? Well, YOU CAN! Every once in a while I crave a good meatball with marinara sauce over spaghetti, but spaghetti noodles are high in carbs and fat. 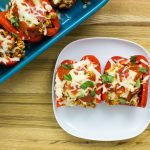 My Meatball Stuffed Spaghetti Squash are everything you love about spaghetti and meatballs without the guilt. Juicy delicious meatballs, stuffed in spaghetti squash and topped with fresh marinara sauce and cheese. The perfect meal when you are craving comfort food! Easy to make and super healthy. This is a Weight Watchers friendly recipe and each squash half with four meatballs is 6 SmartPoints. I have a fun little agreement with my husband that on Sundays, I will make him whatever dish that he wants, no healthy food. He is obsessed with football, so on Sundays he’s on the couch watching football all day. During the week, I make only Weight Watcher friendly meals so on Sunday we consider that day to be our splurge day. A while back, he asked me to make meatball subs. I had never made this before so my first reaction was “Challenge Accepted!” The thing is… I made the meatballs with 96% lean ground beef so technically this “splurge” recipe was Weight Watchers friendly! Anyways, these subs were amazing and I will be sure to post that recipe soon. The meatballs turned out to be amazing and the sauce was heaven, so it turned out to be a pretty great meal for Sunday football! After that Sunday, I dreamed about those meatballs and sauce for at least a week so… can you imagine having dreams about meatballs?! I have too many random dreams about food that I really should start to leave a pad and paper next to my bed so I can document the dreams I have. Sometimes, I randomly crave a big bowl of spaghetti but I try to save that meal for a splurge day. The noodles are just too high in carbs and fat for me to eat during the week without feeling overly guilty. Luckily there are different types of vegetables out there, squash to be exact, that have the same consistency as noodles without all the guilt. That’s where spaghetti squash comes in. This vegetable is magic! 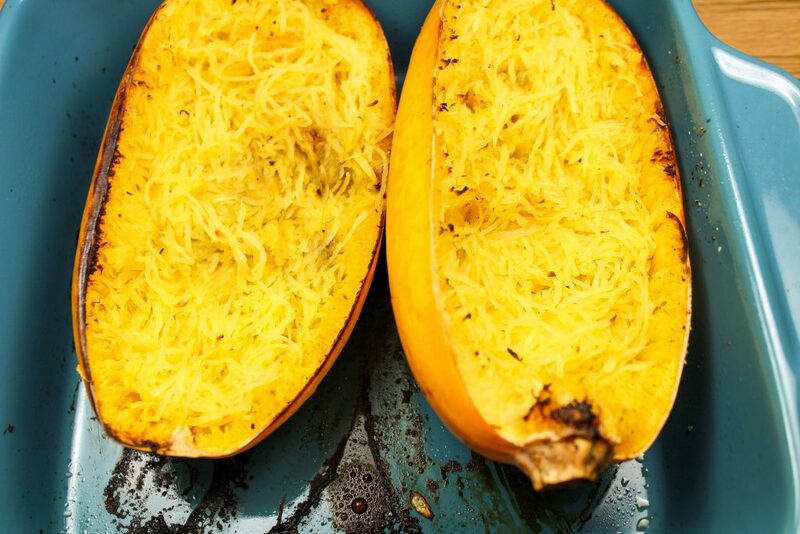 Have you ever had spaghetti squash before? If you haven’t, I guarantee that after you make this squash once, you will be making it on a regular basis! It takes a little bit of time to bake in the oven, but it just like spaghetti noodles. It’s amazing! I love using spaghetti squash in place of noodles when I’m craving a dish like this one. This recipe is packed with all the traditional flavors you love about spaghetti and meatballs without all the carbs of the spaghetti noodles. This recipe had a few steps and takes about an hour or so to make. The squash is really what takes the longest to make. 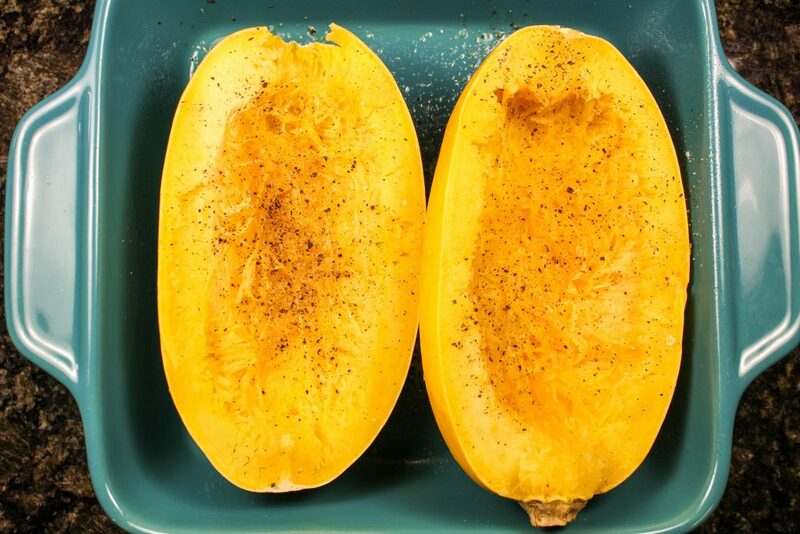 To make spaghetti squash, pierce the outside with a fork, place in a microwave safe dish, and microwave for about 5 minutes, flipping halfway through. This step is key because microwaving the whole squash for a little bit really makes it easier to cut the squash in half. After the squash has cooled down a bit, cut the squash in half lengthwise and scoop out the seeds. Next, spray a casserole dish with cooking spray, season the cut side of the squash, then lay it cut side down in the casserole dish. Roast the squash for one hour. Roasting the squash can totally be done ahead of time! You could do this on Sunday for meal prep day that way you have the roasted squash ready to go during the week. The next star of this recipe is the meatballs. I prefer to make my own meatballs that way I know exactly what ingredients I am putting in them. Meatballs are actually easy to make! Just mix all the meatball ingredients into a big bowl, then form the meatballs, lay on a baking sheet, and bake in the oven for 12 minutes. What really makes this recipe even more special, aside from homemade meatballs, is the homemade marinara sauce. While you can buy jarred marinara sauce, I seriously recommend making my Twenty Minute Marinara Sauce. 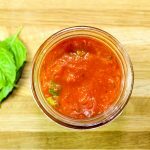 This sauce is packed with amazing flavor, it’s super easy to make, and ready in twenty minutes! After the sauce has been blended and the meatballs are done baking, add the meatballs to the sauce and let them cook until the spaghetti squash is done roasting. After the squash has roasted and is cool enough to touch, turn squash over and with a fork, scrape the inside so that strands start to appear that look like spaghetti and fluff up. And just like that, you have spaghetti squash noodles!! To finish off the dish, lay the squash bake in the casserole dish with the cut side up, top each squash half with four meatballs, marinara sauce and mozzarella cheese. Bake in the oven for about 4 minutes until the cheese melts! 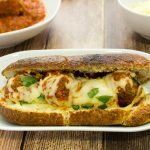 Meatball Stuffed Spaghetti Squash are everything you love about spaghetti and meatballs without the guilt. Easy to make and super healthy. 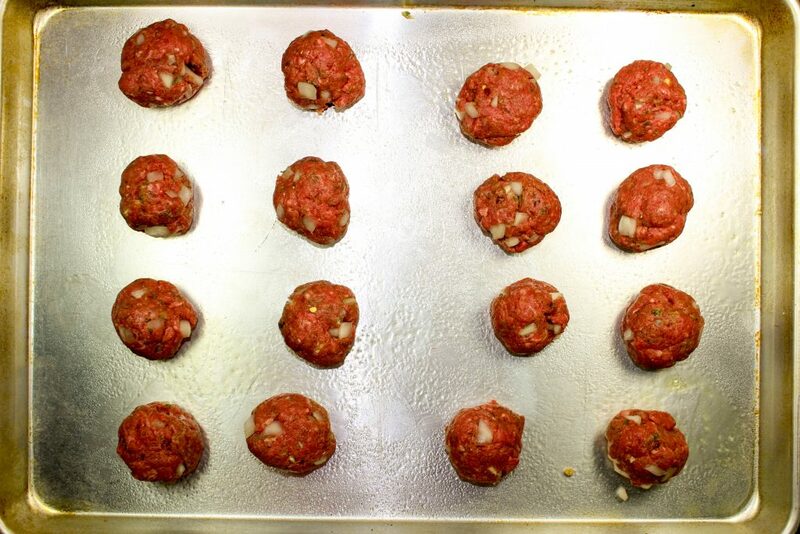 This whole dish is so delicious… from the homemade beef meatballs, to the homemade fresh marinara sauce. Guaranteed to be a family favorite recipe! Make Twenty Minute Marinara Sauce. Once the sauce is done, keep in a large pot on low heat. 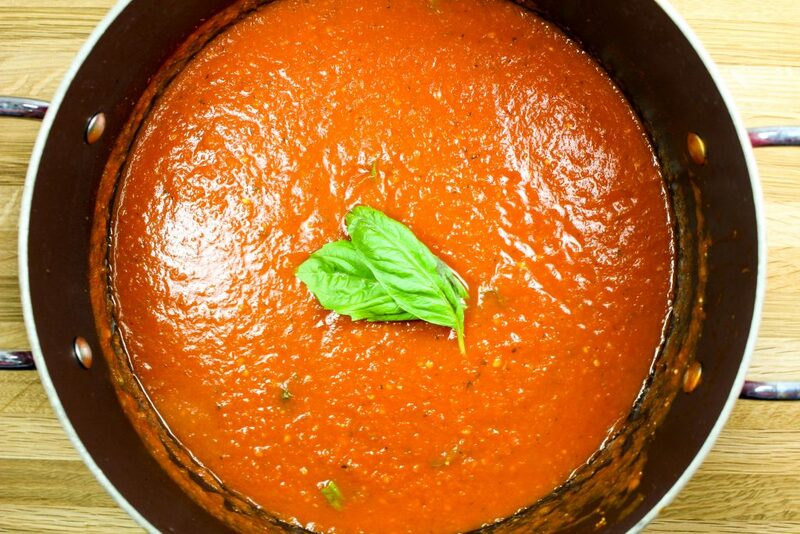 If you are not making that recipe, pour jarred marinara sauce into a big pot and heat over low heat. Piece spaghetti squash several times with fork. Microwave for 5 minutes, flipping once. Cut squash in half lengthwise and scoop out seeds. Discard seeds. Season cut side of squash with salt and pepper and spray with cooking spray. Lay squash in dish cut side down. Mix all ingredients and form into 21 meatballs. Bake in oven at 450 degrees for 12 minutes. Add meatballs to marinara sauce and let cook for 20 minutes. After squash has roasted and cool enough to handle, turn squash over and with a fork, scrape the inside so that strands start to appear that look like spaghetti and fluff up. 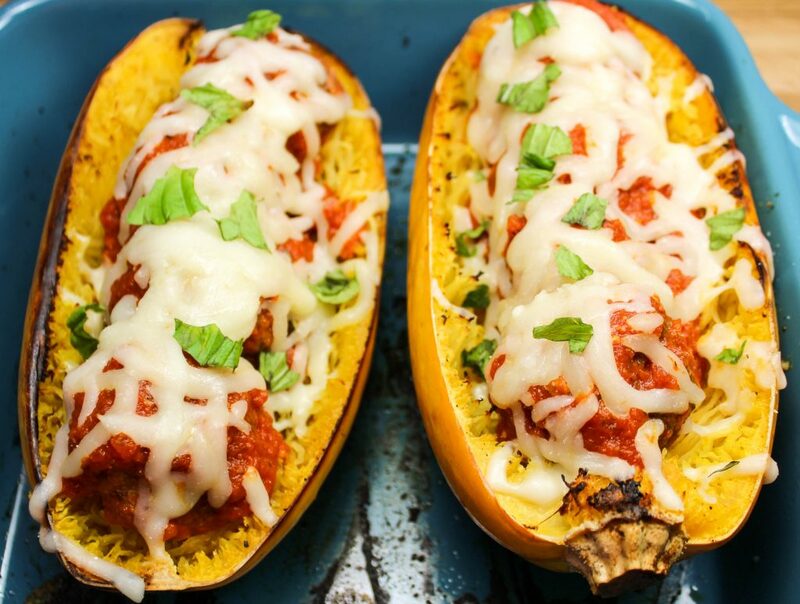 Top each squash halves with 4 meatballs, 1 cup marinara sauce, and ¼ cup shredded mozzarella cheese. This recipe makes 21 meatballs, but you only can fit 4 meatballs in each squash half (for a total of 16). You can freeze the left over meatballs! To speed up time, roast squash on Sunday that way you have roasted squash ready to go during the week for this recipe. Another time saver is to make the sauce and bake the meatballs while the squash is roasting in the oven. December 8, 2016 at 3:49 pm What a creative recipe! Perfect for cold weather when you want something healthy and filling! December 8, 2016 at 5:35 pm Yes... Perfect for cold weather days! Thanks for commenting Rose! December 9, 2016 at 7:46 am This looks and sounds great! I love healthy but flavorful recipes. December 9, 2016 at 9:13 am It really is good! Thank you for commenting Stacy! December 12, 2016 at 3:24 pm Thanks Clarissa! I hope you give this spaghetti squash recipe a try... It is GOOD!